In today’s A lab Aloft blog entry, International Space Station Associate Program Scientist Tara Ruttley shares her point of view on the importance of asking the big questions via station research. When I do public speaking events, people always ask me what’s my favorite investigation. For me it’s usually the Alpha Magnetic Spectrometer, or AMS investigation. 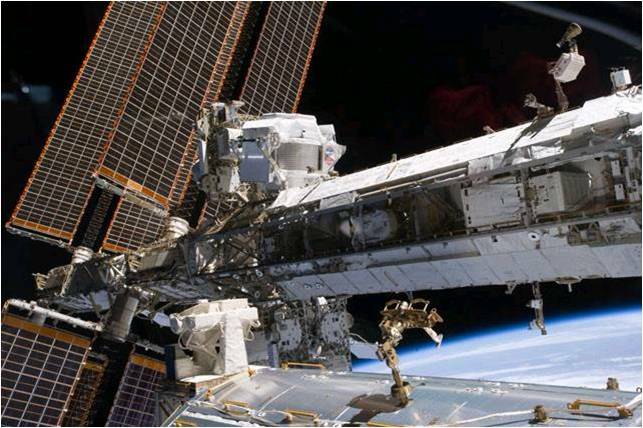 This incredible instrument is a particle physics detector mounted to the outside of the International Space Station. The AMS was developed by Professor Samuel Ting, a Nobel Laureate in physics, along with an international collaboration of 16 countries organized by the U.S. Department of Energy. The goal of AMS is almost like sci-fi, involving the search for dark matter, dark energy, antimatter, and even something called strangelets. You hear about these things growing up and on TV and you wonder, is that real? If you go past the scientific jargon, the purpose of AMS is to answer a fundamental question in our nature. To ask, as we have from the beginning of time, how did the universe begin? The answer to this question intrigues me, like everyone else, because it inevitably addresses “who are we and what are we doing here?” Everybody would love to know, so we seek the answers the best way that we humans can: pushing technology limits to find evidence in ways that our own human senses cannot. The researchers behind AMS are trying to get solid data to support one of the more prevalent theories: the big bang. In a nutshell, this theory says that the universe came together, particles condensed, and boom! You got us. It’s a little more complicated than that, but the theory behind it is that for the big bang to even occur, you had to have equal parts matter and antimatter. Matter is something we can see and feel, it’s all around us and makes up everything. It’s so very obvious! Antimatter is a little more tricky for us. It is the opposite of matter and we can theorize that it exists and even make small, fleeting samples in laboratories. And so we are using AMS to look for these things that we mere mortals aren’t capable of perceiving for ourselves. AMS’s space shuttle-mounted predecessor actually found evidence of antimatter a few years ago, so we are only teased by this potential and are now prompted to capture the particles in greater, consistent amounts for study. Now we’re ready to collect lots of evidence for antimatter levels that will keep Nobel laureates, post-docs, and graduate students busy analyzing for years. 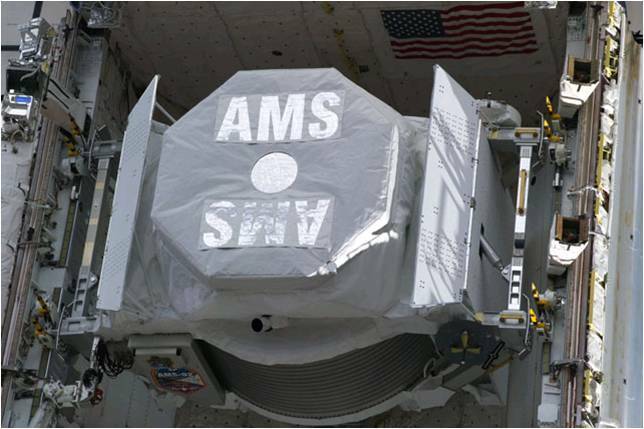 Since its installation on station, which marked a one year anniversary on May 19, AMS has been collecting about a billion observations per month and even the smallest bits of data are going to lead to hundreds of publications. These will cite the importance of AMS findings with a relevance that likely only super smart astrophysicists will understand, and that the rest of us will see in headlines here and there as new evidence unfolds. Using AMS, we record as much data as we can and analyze it here on Earth. This is where we try to tell an ultimate story with it. It’s what we do in science: chip away at a question until we can come to a conclusion that is always just beyond the next discovery. Yet, as exciting as the headlines will be, I actually tend to struggle with what’s next on these findings. I struggle because, since as we gain bits and pieces of knowledge, inevitably we learn not only what we didn’t know, but how much more there is to know. Can you sense my impatience and excitement? Observing antimatter is the first data goal that goes back to the big bang theory. The next data set AMS looks for is dark matter or dark energy, which is fun for me because it further proves that there’s more out there than meets the eye. We humans have senses for sight, sound, smell, taste, and touch, but we are limited to the capability of our receptors as we constantly take in our environment. We miss things that could be right there in front of us. One of the limits of our eyesight, for instance, is that we can only see a certain spectrum of light. We don’t see the ghastly amounts of waves that pass all around us as our wireless devices talk to each other, or our radios blare during our morning jog. Our eyes see only 5 percent of the universe! We can sense that the other 95 percent of the universe exists, however, because we have found tantalizing evidence through research. We are using AMS as an extension of ourselves to fill in the gaps of our senses and help us understand the unknown. This includes the parts that we don’t even know we don’t know yet. AMS also is looking for evidence of a type of matter called strangelets. Yes, it does sound … well … strange. This would be a new form of matter that we have theorized existence of, but haven’t found in nature quite yet. We’re taught in school that all matter is made of atoms, which we thought were the smallest form of matter. Now scientists are finding that atoms are made of even smaller quarks, and the prevailing theory regarding quarks is that there are six different types in the universe. We have classified all matter on Earth as being made up of only three types of quarks. So why does nature need the additional three? Some scientists theorize that there are other forms of matter out there that would be made up of a combination of these six quarks, and they’re calling them strangelets. It is a creative effort to try to answer what and where these strangelets are. Scientists have created such evidence as “strange” and “antistrange quarks” in heavy ion accelerators, which they theorize could lead to strangelet formation, but as of now, a strangelet is still a hypothetical particle. The prospects are endless. Only the space station is capable of supporting the power and data transfer AMS requires to look for evidence of antimatter, dark matter, dark energy, and strangelets, and it will keep the scientific community busy for years. The human species develops tools like AMS to find the things we might otherwise miss, because we seek answers — lots of answers. It’s our nature. AMS is an instrument that is taking it all in and ultimately it’s humans who will try to make sense of the information and apply it to what we know or think we know. We’ll learn what we didn’t know and try to tell our own local story. As we advance as a species, we build on that knowledge that may one day expand with the universe, beyond our little planet. It’s a good time to be a science geek. Tara Ruttley, Ph.D., is Associate Program Scientist for the International Space Station for NASA at Johnson Space Center in Houston. 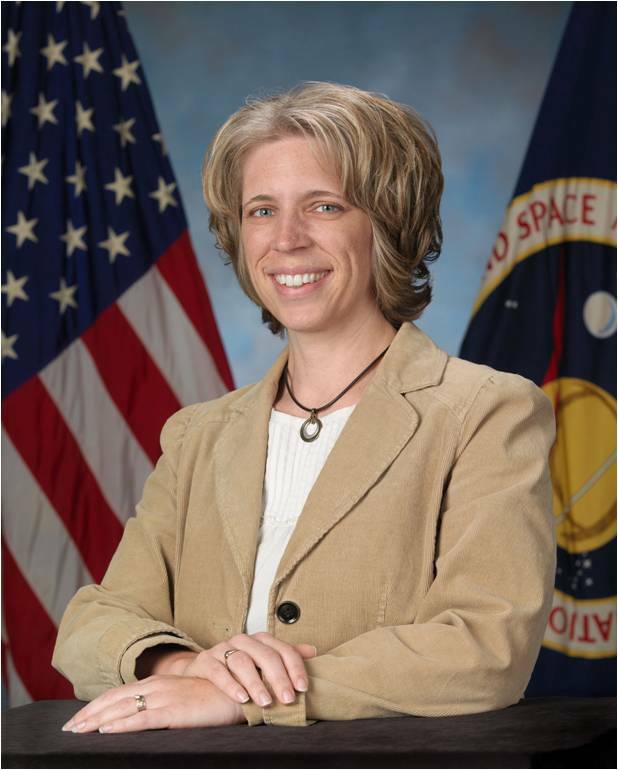 Ruttley previously served as the lead flight hardware engineer for the ISS Health Maintenance System, and later for the ISS Human Research Facility. She has a Bachelor of Science degree in Biology and a Master of Science degree in Mechanical Engineering from Colorado State University, and a Doctor of Philosophy degree in Neuroscience from the University of Texas Medical Branch. Ruttley has authored publications ranging from hardware design to neurological science, and holds a U.S. utility patent. It is the first time that I visit your site and I find very interesting also. I will return for other items. Thanks for letting me try to drive you crazy with my theory’s no harm intended.Even if the universe or at least the first universe that ever came into being may have came from nothing because even where you have nothing there would be no energy at first but over time or in a split second it would have gotten so cold beyond our imagination,at this point a great pressure would have taken place generating energy of some sort’s So the question really is how did this energy get created.It’s my guess that every thing from solids liquids and gas was created by energy or a bi product of energy.